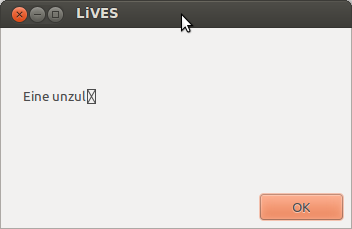 Using Ubuntu 12.04 and the provided LiVES package has an issue with the German special characters (Umlaute). The first special character cuts the message. This is an error message that happens at startup. The LiVES translation in Launchpad  seems to be outdated/unused (at least for the German language: 2116 untranslated strings). I can't find the string »Eine unzul…« shown in the screenshot. Anyway this issue looks like an i18n problem within LiVES itself. The project is maintained by Salsaman  at Sourceforge . LiVES bugs are maintained there . If agreed, we should rise the issue in the SourceForge bug tracker or contact Salsaman. Any other ideas?